The Saifee Hospital is a State of the art, modern hospital built in Charni Road region of Bombay, India. It has 33 specialized departments, 200 doctors and 295 beds. The Saifee hospital was envisioned originally by Syedna Taher Saifuddin [RA], who led the Dawoodi Bohra community from 1915 to 1965 and fostered efforts in medical care for the community. The Hospital was rebuilt by the head of the Dawoodi bohra community His Holiness Dr Syedna Mohammed Burhanuddin [TUS] with contributions from Community members and was inaugurated in June 2005 by the Prime minister of India, Dr Manmohan Singh. To achieve excellence in healthcare by providing world class Preventive, Curative and Holistic care to individuals from every strata of society in a safe ethical and affordable manner.The Saifee hospital was envisioned originally by Syedna Taher Saifuddin [RA], who led the Dawoodi Bohra community from 1915 to 1965 and fostered efforts in medical care for the community. The Hospital was rebuilt by the head of the Dawoodi bohra community His Holiness Dr Syedna Mohammed Burhanuddin [TUS] with contributions from Community members and was inaugurated in June 2005 by the Prime minister of India, Dr Manmohan Singh. The hospital is committed to achieve excellence in health care by providing the latest technology for diagnostic and therapeutic services set up with excellent ambience. Employing a team of highly qualified and committed consultants and paramedical staff, combined with state-of-art of technology, the hospital ensures quality medical care to meet the demands of different age groups and risk profiles. 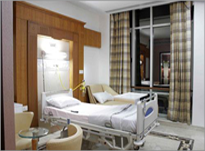 The Hospital offers a wide range of tastefully furnished recovery rooms along with panoramic and serene surroundings, homely atmosphere and comfortable accommodation. The objective of practicing medicine that is safe, ethical and affordable is achieved while offering succour and relief for the sick.